Coaches: Be sure you are aware of all rules and rule changes. 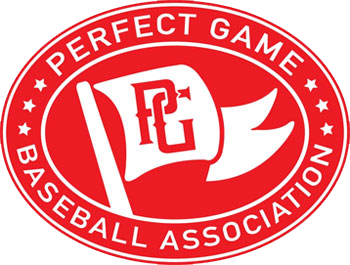 Perfect Game reserves the right to amend these rules at any time for specific tournament play. National High School Federation Baseball Rules will be enforced with the following exceptions. TEAMS DEPARTING BEFORE THE END OF THE TOURNAMENT WILL NOT BE ALLOWED TO COMPETE IN THE PLAYOFFS!!!!! If this happens we will take the second-place team out of the pool or the next best team. The Tournament Director will rule in the fairest possible way. Pool Play: All Pool Play games will be played with a strict two-hour time limit. No inning can start after two hours. Time will be kept by the PG Field Director. For each team's pool games, the home team will be predetermined. All pool games that are tied after 7 innings or the 2-hour time limit will be recorded a tie. A tie is equal to a ½ win and ½ loss for each team. Championship Round/Playoffs: No two teams from the same organization will match-up in their first playoff game, unless the game is affected by a bye (Applicable to brackets with 9+ teams). 2-hour time limit will be used in all games except the Semi-final and Championship games. This rule is subject to change. The home team in Championship Play will be the higher seed except when there is no seeding. When there is no seeding, the home team will be determined by a coin flip. This is the case even if the schedule says otherwise. Tie Breaker: If after 7 innings or 2 hours the two teams are still tied the following tie breaker rules will go into effect except for the Semi-final and Championship Games. The last three hitters from the previous inning will load the bases with one out. Normal substitution rules apply to these runners. The hitting team will start the inning with one out. Play continues until one team is ahead at the end of an inning. Semi-Final and Championship games will be played with regular extra innings through the 9th inning. Starting in the 10th inning the last three hitters from the previous inning will load the bases with one out. Forfeits: All games must be started with at least 9 players. A player must be at least 13 years old to compete in a 16U-18U event. A game can be finished with 8 players. If there are no eligible subs the player leaving the original lineup will be recorded as an out until he is able to return. Any intentional forfeit could result in the forfeiting team being eliminated from the tournament. The tournament committee will rule on all forfeits. No team should benefit from the result of a forfeit in an unfair manner. This rule could result in a dispute and the tournament committee reserves the right to look at and rule in the fairest possible way. The committee’s decision will be final! A forfeit score will be the average runs scored for the winning team to 0 for the losing team. The tournament committee will decide when a forfeit is declared. Taking Infield: No infield will be allowed during the tournaments. Mercy Rules: 15 after 3, 12 after 4, 8 after 5. Trips to the mound: The members of the coaching staff (including the manager) can make one mound visit per pitcher per inning without needing to remove the pitcher from the game. If the same pitcher is visited twice in one inning, the pitcher must be removed from the contest. Hitting lineup: Can consist of 9, 10, or 11 players. The lineup must stay with the same number of batters for the entire game. Once the first pitch has been thrown the lineup is locked, and the number of batters may not be changed. The 10th and 11th hitter if used will be designated as an EH and XH on the lineup card. The EH and XH may bat at any spot in the order. The EH and XH is the same as any position on the field as far as substitutions are concerned. The starting pitcher is allowed to DH for himself and bat in any slot in the order but must be listed a P/DH on the lineup card. In case of rain: All rain out games may not be made up depending on time constraints. In case of scheduling changes, it is the team's responsibility, not the tournament committee, to make sure they are aware of the new schedule or any scheduling changes. This information will be posted on the tournament web site when it becomes available. Note: No special requests will be honored if rescheduling becomes necessary. Tournament format is subject to change at any time if deemed necessary and will be determined based on the fairest outcome for all teams. All coaches should make sure the tournament committee has current contact info. If games are cancelled, pool winners and championship qualification will be determined by the tie breaking procedures (listed below). Stop in Play: If a game is stopped, the game must start within 1 hour of the stop in play. If games are not resumed, they will become suspended or called official. Games called by umpires that cannot be resumed within 1 hour will be considered an official game, if 5 innings have been completed, or 4 1/2 innings if the home team is ahead. After 5 complete innings, a tie score will be recorded a tie in pool play. The tournament director can extend the 1 hour if there are extenuating circumstances, i.e. lightning detector, working on fields, etc. A suspended game will resume where the game was halted. In the event play is stopped for any reason before or during the Championship round, first place, second place, third place, etc. will be awarded based on PG Seeding and Tie Breaker Rules. Protests: Judgment calls and pitching limitations are not eligible for protest. Protests will be heard and ruled on by the tournament committee. The team protesting must make cash payment of $100 at the time of the protest. If the protest is ruled in the protesting team’s favor the $100 will be refunded. The ruling made by the committee will be final. Protests must be filed and ruled on before the next pitch if during game, or before umpires leave field if after a game. Roster and Roster changes: All players should be listed on the official roster. Playing a non rostered player could result in a forfeit. If a player is listed on more than one roster, the player listed will make a decision as to which roster he is legally on. This decision is up to the individual player. No player can appear in a tournament game for more than one team. If there are multiple events going on at one time players are permitted to play for one team in each event if so desired; pitching limitations still apply to the player. Age divisions within a tournament count as separate events. A player who is in violation of the age eligibility shall be considered an illegal player. If anytime during a tournament game, a player is discovered illegal due to an age violation or participating on more than one team in the same tournament, the team is subject to forfeit. The first team a player participates for is their official team. *This does not apply to Pitch Smart violations. Participating players shall have photocopies of their original birth certificates (US) or passports (International) in the possession of their team manager. Electronic copies of ID documents are accepted. Failure to have a copy of a birth certificate, in the event of a protest, could result in suspension for the remainder of the event until such document can be produced. Driver’s License is permitted. For events classified by graduation year, transcripts from a players most recent academic semester shall be in the possession of their team manager. Scoring: We recommend that all teams (home and visitor) keep a scorebook. The official scorebook and lineup card for the game will be kept by tournament staff, in case of emergency where staff can't keep book the home team will be the official scorer. In a situation in which tournament staff and the home team are unable to score the visitor would become the official book. All subs should be reported to the umpires. To eliminate scoring disputes scorekeepers should check with the official scorer during and after the game. Line up cards must be fully filled out with players first name, last name, position, and accurate jersey numbers. All substitutes should be listed with accurate jerseys numbers. Failure to produce a complete lineup card can result in games not starting on time. Line up cards are to be given to the official scorekeeper before the home plate meeting. Sportsmanship: In the interest of maintaining a quality event, the tournament committee reserves the right to eject any person from the site for unruly or unsportsmanlike behavior. Physical attack on an umpire, tournament official, associate director, associate officer, and/or any player or fan prior, during, or immediately following a game played under the authority of Perfect Game. Assault on an official is a felony in some states. Players, coaches, managers, fans, spectators, or sponsors threatening an umpire, tournament official, associate director, or associate officer with physical harm. Any player, coach, manager, sponsor, fan, spectator, director or officer who engages in physical fighting. Using unsportsmanlike conduct or abusive language, symbol tactics, or derogatory or unbecoming acts. Destruction of property or abuse or failure to pay. Competing under an assumed, false and/or altered name. Tournament hosts have the authority to eject a player, fans or team anytime during a tournament of committing any of the above listed offenses. A player, spectator, fan or coach ejection carries removal from that game only. Any spectator, coach, manager or player who is ejected for the second time during the tournament will be eliminated from participating for the remainder of the tournament. Any event that results in physical altercation (before, during or after a game) could result in a forfeit for both teams. Tournament committee reserves the right to remove teams from playoff contention. WWBA - Wood bats only. Must be composed of one single piece of wood. Current legal composite bats are listed online under the "Bat Restrictions" tab of the event page. BCS/S25 Tournaments - All bats must meet BBCOR regulations. Wood bats are allowed. 13U - Metal bat. All bats must have branding, label, or stamp proving BPF 1.15 or BBCOR on it. There is length to weight ratio maximum of -5(5 ounces). Wood bats are allowed. Pitching: The MLB balk rule will be enforced. When a balk is called it is NOT a dead ball. The 3B to 1B pickoff move is legal. Also, in the windup position, a pitcher is permitted to have his "free" foot on the rubber, in front of the rubber, behind the rubber, or off to the side of the rubber. Enforced Pitching Limitations: All PGBA Red events will strictly follow the Pitch Smart guidelines, unless otherwise noted. All other PGBA events are strongly encouraged to follow the Pitch Smart guidelines and enforce them as a rule. Check the Pitching Restrictions tab on the event homepage as well as the PitchSmart report; when applicable. Courtesy Runners: Courtesy runners can be used for the Pitcher and Catcher at any time but must be a VALID SUBSTITUTE. If a team is batting their entire lineup, then they will NOT be able to use last batted out. In addition, the same substitute CANNOT run for more than one position (Pitcher or Catcher) in the same game. Not covered in the Rules: In the event any item is not covered in these rules or NFHS rules, the tournament committee will make the fairest possible ruling and that ruling will be final! 9U-10U: All games will be played on 46x65 fields. 11U-12U: All games will be played on 50x70 fields. 13U-18U: All games will be played on 60x90 fields. Least total runs allowed in pool play.